The sun was a flaming mass of boiling hotness and the mighty squid was taking on the mighty Whale for the first ever trident cup. Skipper Will lost the toss and the Octopus elected to bowl. The harsh summer sun had burnt out anything green and the ball really didn’t want to come on to the bat. Openers Dean and Pip struggled against the opening pair of bowlers and with only 12 on the board (after 5 overs) Pipo had his stumped knocked about. Enter Channa, wielding the mighty Excalibur. With Dean starting to strike the ball cleanly the Whalers scoreboard ticked over. Channa and Dean managed to see the danger bowlers off, but were still only 45 at the 15th over. Channa was caught, soon trying to knock the stuffing out of the ball, for 17. Whalers Debutant Nishan was next in. Having taken a seven year break from cricket he was understandably keen to get going. Unfortunately it was not to be and he was bowled for 8. 83 for 3 of 25. Next up was Skipper Will, who played a cracker of an innings, easily supporting Dean, and also adding some well-timed boundaries. Dean was firing from the other end, with 3 consecutive sixes, getting the scoreboard to trot on. Dean was eventually bowled for 70, having missed a straight one. The Whalers were 131 for 4 of 30 and rapidly running out of overs. With 5 overs to go the batsmen tried to accelerate, with Mildon and then Dan supporting Will, who ended with 47. Kieran and Dan saw the last few overs out and the Whalers ended on 178 for 6 of 35. Tea, cold compress, and losing the keeping gloves. Dan and Amit opened the bowling with Dan really getting the ball to zing off the top. In fact he was so successful that he got a wicket in the first over, after the opener edged it behind. Dean took a fantastic one handed diving catch amidst much early celebration. Made 44; Mildon taking an excellent catch on the boundary. The remaining opener didn’t last long, caught by Pip of Nishan’s bowling. 104/2 of 17. The Whalers hoped the tail would wag. Despite some good bowling from Special and Nishan the replacement batsmen plugged away at the total. The next wicket didn’t fall until the 22nd over when the number five bat was run out after an excellent thrown from the boundary (Dean) caught him napping. Run out for 17, the Octopus on 135 for 4 off 22. The Whalers were tight in the field but despite the effort, didn’t have enough bowling power, or in fact runs. Josh and Kieran added their weight, and the Whalers managed to take two more wickets. One, a smart stumping by Dan (replacing Dean as keeper) of Josh’s bowling and the other a lofted cover drive by the Octopus’s wicket keeper, who found Josh lurking in his favourite long on. 170 for 6, in the 30th over but it wasn’t going to happen. Not today at least. Octopus won by 4 wickets, but it was an evenly matched game and we hope there will be a rerun next season. This entry was posted in Uncategorized on August 13, 2018 by whalers1. 9 Whalers, old and new, gathered on a very hot Saturday for a shortened T20 game versus Salix. Salix captain Dave won the toss and elected to field and kindly offered the services of Tony to allow for a 10 vs 10 game. Dean and Andrew headed out to bat with 200 assumed to be a par score on a sun-baked wicket. The pair got the Whalers off to a flyer punishing any loose bowling taking 67 off the first 4 overs. Salix switched their bowlers around but the carnage continued with the 100 partnership being raised in just the 7th over. Andrew was eventually dismissed just after reaching fifty, bowled trying to continue his onslaught. Salix then pinned the Whalers back, removing debutant Tom, Will and Josh in quick succession. Dean, however, continued to prosper and raced to another Whalers hundred, bringing up the milestone with an enormous 6, before retiring not out 103. Dave, in just his second game, struck a couple of good boundaries and with Nick “I’m a specialist batsman now” Howes moved the Whalers past 200. After Dave was bowled for 13, Russell and honorary Whaler for the day Tony hit a couple of boundaries to further increase the score. The Whalers eventually finished on 223-9 for their 20 overs with Nick 21*. With the clock ticking ahead of England vs Sweden, both teams hurried through a short drinks break and headed back out for Salix’s chase, Yovaan and CK opening the innings. Yovaan showed early intent hitting some cracking shots and damaging opening bowlers Nick and Special’s figures. Nick made the breakthrough in his 3rd over when he had CK caught by Andrew for 3. Salix No.3 Johnny lent Yovaan valuable support and they continued to hit boundaries with alarming frequency. A couple of dropped catches further helped them on their way. Yovaan was eventually run out by Will following a mix up for an very well-made 65. Will, staking a claim for a specialist fielder role, soon ran out the next batsman for 6. Salix were now on the back foot. Having taken some punishment in his early overs, Josh then got in the act picking up 3 quick wickets, including an excellent delivery to remove No.3 Johnny. Another run out followed, this time by debutant Tom and Andrew picked up a wicket in the final over of the match. Salix finishing on 130-9 from their 20 overs. The teams then rushed back to to the clubhouse to eat tea and catch the England vs Sweden Quarter Final. Big thanks to Salix for being so accommodating and lending us a player. The Whalers winning streak continues! This entry was posted in Uncategorized on July 9, 2018 by whalers1. Only 14 Whalers players were able to attend in the end despite the email pleas. So a 7 a side match was arranged giving each team given 2 sets of 15 over innings. Each Batsman had to retire at 30 runs but could return. The Captains reply was led by Ed and Will with Matt “ the Chuneorer “ and Roland opening the bowling. A tight first over from Matt restricted the Captains to just 7 run. Roland 2 overs cost only 21 runs but a sure fire LBW decision against Ed was turned down,, even Ed thought he was gone!!!! Roland had a slight revenge by taking a steepling catch deep in the outfield to get rid of Will to give Matt his wicket. Ed used his second chance to grind away to 30 giving out some good catching practice along the way . In the meantime JT was bowled by Amit, Al took a good catch off Amit to get rid off Keiran and Amit picked up his third wicket when Russell took another good catch. Some semblance of balance was bought back to the proceedings from Nick and Jack who both scored freely and even manages to finish the Captains 10 runs ahead. How did that Happen!!! I think wide balls and aggressive running told its own story. A BBQ burger Lunch and the World Cup match interrupted the break in innings by an hour or so as did those that had a cheeky beer in the sun to cool down. Roland and Russell opened up trying to reduce the deficit and before we were into the black, Russell was bowled by Josh and Al was bowled by JT. Matt was back in a number 4 and looked to up the tempo. He soon asked for a risky second run and Roland was given run out by a direct hit even with a grounded bat and an umpire that had hardly moved.! So 3 Down and about 5 runs in credit looked like a crisis but back in came Amit. But he managed to retire 3 times for the same shoulder complaint and the wilting bowler soon Face Dean at the wrong end of the innings, Having again retired having reached 30 in quick time. Matt duly gave his wicket away having to face a mild run up from Nick seem to scare him. Back came Dean with Luke although Luke was trying desperately many times to give his wicket away and Dean finished a mighty 77 not out/. 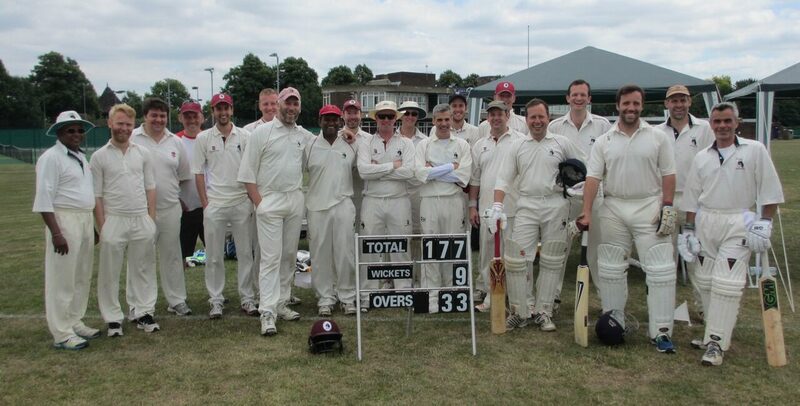 Again 161 runs were scored setting the Captains a score off 151 off 15 overs to win it. The captains soon lost Jack to stumping behinds the wicket even though the stump bails and ball ending near silly short leg. Al had his wicket but at cost of 23 runs, Russell was economical until his 3rd over conceding 15 runs. Amit came in first change despite the suggesting how can bowl on a poor shoulder. Answers on a postcard.!! But impressive hitting from Nick particularly Josh,, Same shot same result.. and then Keiran meant that all 3 had to retire at 30.. the president’s men looked in trouble. Nevertheless In came Matt to bowl and with surprise bowler Dean.. Matt Bowled JT with a beauty that hit top of off stump and Roland’s shoulder at the same time. Dean gave Ed the run around with variance in pace and flight and Ed got an inside nick for the keeper to take a smart catch. Better fielding and less extra runs conceding meant the presidents squeaked home by about 7 runs with Will unable to hit the required number of 4’s to give the captains a second win on the trot. All players went back to the bar to get out of the sun to finish off the BBQ leftovers and more beers. This entry was posted in Uncategorized on July 8, 2018 by whalers1.